My first available memory of Rush was them playing on The New Music many years ago. I was about ten, doing normal things grade five kids do, like gritting baseball cards, playing soccer and watching Fellini movies. 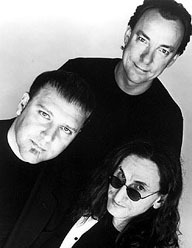 I thought that the three members of Rush looked like deranged, shaggy Muppets, but when I heard Geddy Lee sing "We've taken care of everything, the words you read, the songs you sing, the pictures that bring pleasure to your eye," that sounded like something my teacher might say. Tyrannical. Not at all sympathetic to my plight. But I have other, better memories of Rush, and the band's albums, Fly by Night, 2112, Farewell to Kings, Hemispheres, and, of course, Caress of Steel, were albums worshipped in high school, songs from the soundtrack of my youth. 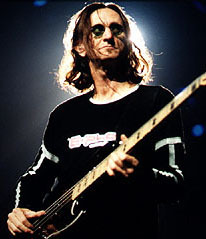 Years later, other things have changed, but Geddy Lee has remained Geddy Lee, the opinionated, literate, dry-witted family man with the blessed-by-God ability to sing and play bass as few mortals can. The yeti hair is gone and the banshee wail is maybe a bit less frenzied, but he stands an elder statesman of rock. And with every new pull of the Rush ripcord we hope that the lawn mower doesn't just cut the grass -- we hope it tears the lawn apart. We all know that that Rush's music is political -- not in a stuffy parliamentary way, but in the way it describes an oppressive future and rallies against the tyranny of the mundane, against "the sounds of salesmen." But how political is Geddy Lee himself? "Well, I read the paper everyday, I get angry about the same stuff other Canadians get angry about. I consider myself to be involved. I'm opinionated. We live in a very interesting society in Canada, and when I was young I thought there wasn't much difference between Canada and the U.S. But now that I'm older I see very profound differences." What about the politics of music then, "the spirit of radio," and the claim that many self-proclaimed cultural barometers have made that rock music is dying like the dinosaurs, struck down by sounds from space? "It's kind of a meaningless statement. I think good music will come out, regardless of style, and electronic music seems to be the popular thing for people to predict is gonna be the next wave. There's enough people predicting the 'next wave' that I think it's a safe prediction that they'll be wrong. I don't think it's something that's predictable anymore." "Rock music -- or pop music, popular music -- has become like what jazz became. There are so many branches off the same tree, now, that I don't think it's possible for one wave to sweep over everybody... I think only the most impressionable part of the audience, which is usually the youngest part, will be swept by any fashion or trend, which will always have a clock attached to it as to how long it will last." Now, I'm curious about who has swept Geddy Lee away musically, and the answer I get is surprising, and much plainer than the flights of musical fancy I was thinking: "I really like the Tragically Hip, and I'm dismayed they haven't become more popular worldwide. I think they have a very interesting take on rock music. And I'm very much a big fan of Soundgarden, but now they've gone by the wayside. It's disappointing." 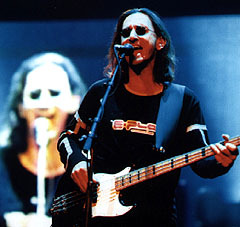 I mention to Lee the comment by Pavement's Stephen Malkmus that he would always respect Geddy Lee for of his ability to sing and play bass at the same time. "And I can walk and chew gum at the same time," he interrupts. "No, really," I tell him. "The runs you play make me think you must have eyes in your chin." Lee laughingly replies, "No, I have eyes in my nose." "Thank you for the compliment, but it's just a function of necessity really. I have to do both and I'm not happy to play boring bass lines, and I also enjoy singing... To a larger degree, as I get older it's a little easier to design my bass patterns that have some sort of sympatico with what I'm going to be singing. Although that might not be easily apparent, there is a fundamental connection." Rush play GM Place on May 16th. Considering copying some of the images from this story? Please read this first. Thanks.